The gallery has the usual list-with-thumbnail structure. The Albums app automatically locates images and videos, no matter where they are stored. Images and videos stored in different folders appear in different sub-galleries that automatically get the name of the folder – which is an effective file management solution. Each sub-album has a thumbnail of the latest image. There is also a camera shortcut, but it’s only available once you start browsing any of the sub-folders. At the bottom of the main album there are three virtual buttons – one for the actual folder list, another for Facebook and, one for Flickr. These two display images from either account or those posted by your friends. Sharing a photo on the HTC Wildfire S is very easy – tap the share button and pick your preferred sharing method. There’s everything from sharing via Bluetooth or email, to posting on Facebook, Twitter or photo sharing sites like Picasa and Flickr. You can also upload videos straight to YouTube. In the HTC Wildfire S image folders you can choose between grid and filmstrip layout (flip the phone horizontally and the accelerometer will take care of the rest). You are also able to mass delete images, but still no mass copy-and-paste options. HTC Wildfire S supports multi-touch and you can take full advantage of it while browsing your images. You can zoom to 100% with a simple double tap on the screen. The implementation here is extra smooth too. Video files can be accessed in the All videos subfolder in the Gallery or from the Videos shortcut in the menu, they launch the same thing. The video files can be viewed as a grid or filmstrip and can be shared over MMS, email, or YouTube, Facebook and Flickr. The video player interface on the HTC Wildfire S offers a full screen toggle (stretch / crop video to fit the screen) and you can scrub through the video too. There are no subtitle, DLNA and SRS support. The video player does OK in general - WVGA MP4 videos were no problem. The player handled all of the XviD videos up to VGA resolution (and few WVGA). Most of the DivX files didn’t though. MKV files are a no-go too. Given the resolution and the hardware we think the Wildfire S gives you the best it is capable of. The standard music library view is the Artists section, but you can easily switch to one of the other six tabs beneath, which are for Albums, All Songs and Playlists. The now playing interface is a Cover-Flow-like visualization of the current playlist – you can swipe sideways to skip songs or go back. You can opt to view the full playlist if you need to skip more than a few phones. Two shortcuts in the top corners act as toggles for shuffle and repeat. From the context menu, you can share a song (over Bluetooth, email or message) and you can set it as a ringtone. The Wildfire S is also equipped with an FM radio, which has a pretty simple interface. It automatically scans the area for the available stations and allows you to mark some of them as favorite. It also supports RDS and allows loudspeaker playback. One thing that annoyed us about the radio is that it takes quite a while to start and stop – about five seconds. The HTC Wildfire S will hardly set the world alight with its audio output, but it's not too bad for a low-end handset. When connected to an external amplifier the achieved results are pretty good, except for the intermodulation distortion, which is a bit high for that scenario. 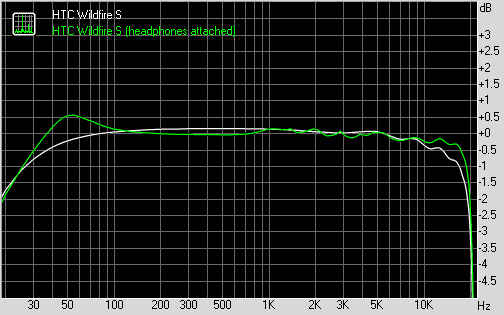 Performance is similar when headphones are connected - intermodulation distortion rises a bit higher, but the rest of the readings are more than the price tag could demand. We are especially impressed by the stereo-crosstalk reading, which is one of the highest we have seen (with headphones plugged in, of course). Unfortunately, volume levels on both occasions are pretty low so the Wildfire S will probably not be the audiophile's favorite. It might do a pretty solid job for you if you are not too pretentious though.